"You Shall Not Kill" or "You Shall Not Murder"? Nearly all English translations of the Bible during the last third of the twentieth century have changed the wording of the sixth commandment from kill to murder. The Hebrew word that appears in the commandment has a broader semantic range than murder. Wilma Ann Bailey discusses why the Protestant and Jewish traditions changed the wording and why the Roman Catholic tradition did not. She also examines the impact that the wording will have in the future for people who believe that there is no general prohibition against killing in the Hebrew Bible and why questions of killing that are broader than murder—death penalty and just war—are no longer part of the discussion of this commandment. Wilma Ann Bailey, MA, PhD, is associate professor of Hebrew and Aramaic Scripture at Christian Theological Seminary in Indianapolis. This is a powerful and prophetic denunciation of unnecessary taking of human life, based on a fresh and convincing study of the commandment, `You shall not kill.' The author argues that the recent decision to translate `murder' is not only erroneous but that it is damaging to those communities, Jewish and Christian, for which biblical texts carry special authority. Brief chapters on the several groupings of Christians and on Judaism seek to demonstrate and support the charge. Given today's war on violence and the actions that have precipitated it, is it not unfortunate indeed that many English translations of the commandment against killing have opted for the translation, `You shall not murder'? I found it fascinating to learn how much political and cultural milieus affect translators and readers who interpret biblical texts. One does not have to be a Scripture scholar to profit from this book. Readers will better understand how different religions approach the Bible and historically what has caused them to interpret Scripture as they do. 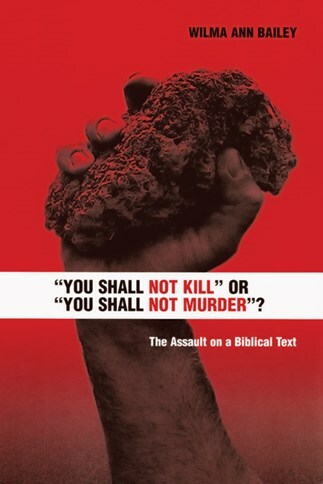 This book is a careful, critical study of how and why the commandment `You shall not kill' became in most modern translations, `You shall not murder.' Bailey's analysis of the verb's thirteen occurrences in the OT does not justify the change, nor is the appeal to the larger `killing' tradition in the OT persuasive. Sobering indeed is the fact that only the translations of the Roman Catholic Church, global in identity, have resisted the changing nation-state cultural ethos of the last half-century that exempts killing in war and capital punishment from this command, while Evangelicals, mainline Protestants, and Jews have accommodated. For Bible translators, expositors, or teachers of the Decalogue, this is priority reading. This book is fascinating and thought provoking, and the topic could not be more timely. Preachers can help congregations raise voices in favor of policies and practices that aim in the direction of a world in which all can experience fullness of blessing. . . . The author sounds a clarion that can become an agenda for mission for many congregations. This book provides an important resource for reopening this conversation at a time when the world desperately needs it. . . . This timely little book by Wilma Ann Bailey stands up to set the record straight on a topic that could not be more crucial at any time, but especially in these days when claims of moral absolutes abound concerning all kinds of human behavior except the most serious. This fine book is written in such a way that everyone can benefit from the study. It is important in the study of the meanings of the value of human life, and the furtherance of non-violence studies. Baily's book demands a new consciousness. A 'do not kill' translation may not settle the question, but it certainly unsettles the situation as it is now. . . . This this book carries a bracing punch.
. . . will encourage readers to personally decide on what the commandment means. The book will serve as a basis for serious religious and social-justice discussions. Bailey's thoughtful analysis provides close reflection on the sixth commandment and disputes the translation "murder." She shows how the change from "kill" to "murder" in translation is ideologically led by a desire to legitimate war that is surely "killing" if not "murder." Bailey carries her analysis to connect with different translation in different church traditions. The implications of her study are enormous for ethical reflection in the midst of ideological fervor. I regard her book as a model of clarity and sound method that merits close attention. There's a lot of substance here to enlighten readers about the practices of a variety of denominations and encourage them to reflect on the issue of killing and murder in American society today.